A Napoleonic reenactor has suffered what could have been a serious incident were it not for her use of historically-accurate natural fibres. 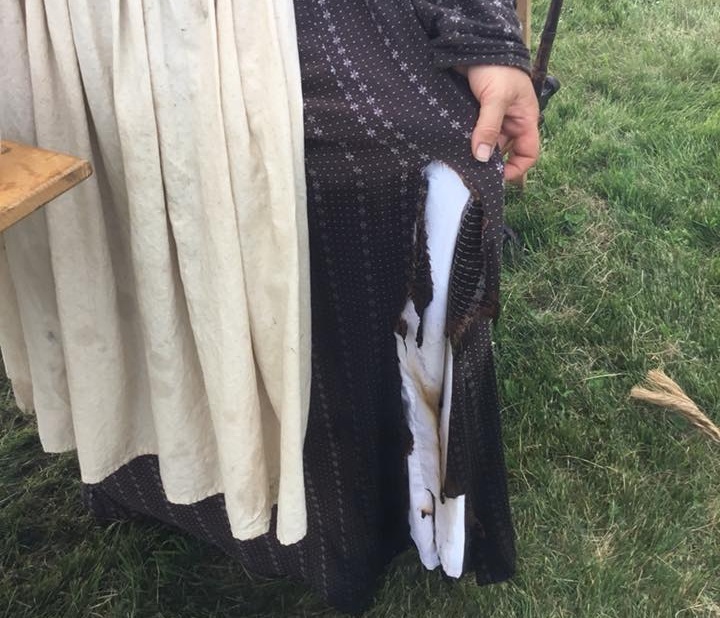 Webb wanted to use this story as a powerful warning to fellow reenactors about the importance of natural fibres in camp life besides historical accuracy when many costume enthusiasts opt for cheaper garments made from man-made synthetics. “Please camp followers remember why we make our clothing from natural fabrics. Imagine if this had been polyester. Also, keep those water buckets full and to the ready by your fires. It was a lesson yesterday nobody expected to have happen,” she said. The image Webb shared revealed the extent of the damage. The fabric is slashed halfway up the Regency skirt’s length, leaving viewers to imagine how man-made fibres could have burned much faster and spread, creating a lethal residue of molten plastic.